We’ve been playing with a brand new toy this week, and James has absolutely loved them. They are Num Noms – cute, scented, collectible play food. Num Noms feature miniature characters inspired by sweet foods and flavours, such as cupcakes and ice cream; the individually scented Num Noms are a recipe for mischief! They are squishy little cakes or scoops of ice cream (the Nums), a motorised hard-shelled inner (the Nom) – ours was a baby with a nappy on and a bow in the hair – sounds crazy and I acknowledge that! You are encouraged to stack them up and put them in the cup or cone using the spoon. They all smell sweetly, and the flavours are based on desserts, for example Raspberry Cream, Banana Go-Go or Peachy Choco Gloss. I opened the packet on our way out of the door the other day. If I’m honest, I was hoping for a walk followed by a nice lazy pint somewhere, and I just knew that this toy was going to grab James’ imagination and keep him occupied. I also had glue, tissue paper and colouring book for Noah, so I had all bases covered. Alas, we actually ended up just going for a walk and not the pub, but James instantly took a liking to the Num Noms from the moment he saw them. We love the fact that Num Noms are perfectly portable so they’re great to take on trips with you. They’ll easily fit into any bag, so they’re a great toy to keep children entertained on car trips, flights or when you reach your destination. The idea is that they are totally collectible. There are over 1000 combinations you can mix and match, with either motorised Nom or a lip gloss. You can buy them in a pack with three Nums and one motorised Nom, plus a spoon and a cup or cone (£8.99), or you can get a mystery pot! 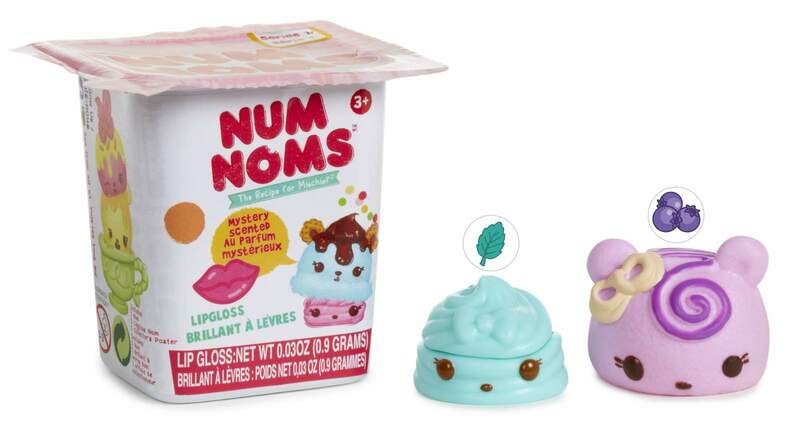 The Num Nom Mystery pots are available at a recommended retail price of £2.99, and include a Num and a surprise flavoured Nom lip gloss in a super cool yoghurt-style mystery pot. Bigger packs are available, and there are houses and other accessories to collect too. James has really enjoyed playing with his Num Nom toys this week. Some toys get played with for a few moments and then pushed to one side but I can honestly say the Nums (less the Nom) have been loved and played with over and over. He’s decided that the chocolate Num is a princess and the cup cake case is her dress. Have a look at the video – you’ll see what I mean! 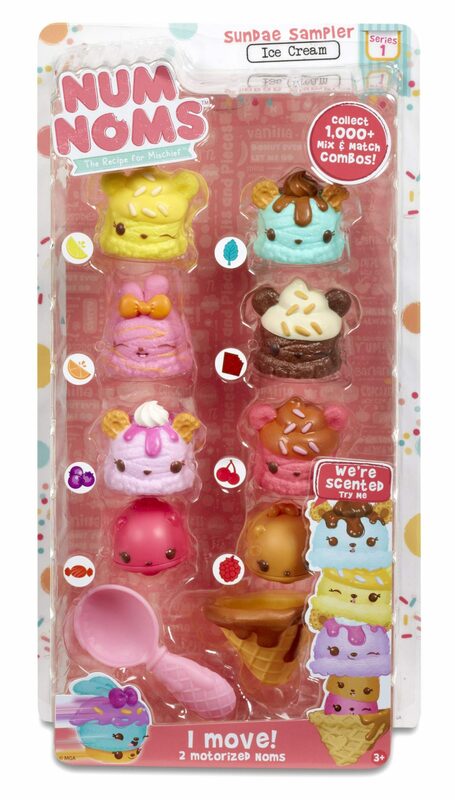 I’ve got one deluxe set and 2 mystery pots of Num Noms to give away! Q: Which is your favourite kind of sundae? When you’ve answered the question, use the Gleam box below to tell me which name you used to comment with. There are more optional ways to enter to put your name in the hat one more time! Giveaway ends on Sunday 3rd July 2016. Prize to be delivered to a UK address only. My favourite is Mint Choc Chip!!! Cherry Garcia by Ben and Jerrys is my all time favourite, or pistachio! Yum. I love coconut Ice cream ! I once had triple chocolate thunder! Basically rocky road with extra chocolate – swoon! Strawberry icecream is my favourite. My favourite is icecream is chocolate. Salted Caramel core Ben and Jerry’s! Yum! Mint Choc Chip is my favourite! My favourite flavour ice cream is blackcurrant & liqorice from a local ice cream farm. My favourite ice cream flavor is chocolate! Got to be Peach Melba! Nowt like it on a hot day! Well…when we get a hot day! 😉 x Thank-you! I rather fancy the Num Noms Confetti flavour but in real life I like Hokey Pokey icecream from New Zealand. Coconut is my favourite flavour. Coconut is my favourite flavour! when we were in Italy I tried an icecream that taste just like Christmas Cake; wish I could remember its name, but it is lush! Banana choc is my favourite in my world and Tutti Frutti is my favourite in NumNom world. It has to be chocolate…double chocolate! So delicious! chocolate sundaes will always be the best in my eyes! I have to be honest and say McDonald’s strawberry Sundae, its the only one I’ve had! Oooo got to be mint Choc chip! When I was a child we used to go to our caravan in Anglesey on a regular basis. ON the way, we used to stop at a little cafe that did a Chocolate Nut Sundae, it was heaven. I basically involved, ice cream, cream, chocolate sauce and nuts, Yum! I love a strawberry sundae with meringue pieces and lots of sauce! rum and raisin is lovely!